Shen-yi Liao is Associate Professor of Philosophy at University of Puget Sound. He is interested in the imagination, but also in too many other things. As you may have seen by now, there is a new Stanford Encyclopedia of Philosophy entry on imagination. (For comparison, you can still access the archived old entry.) In this post—speaking only for myself—I want to talk about the main changes and their rationales; and also invite this blog’s community to contribute suggestions for further improving this resource. To start, here is a side-by-side comparison that shows the structural changes. As any loyal reader of this blog can tell, contemporary philosophical work on imagination is incredibly diverse. There are three brand new subsections of the entry that track new entry points to this literature: the connections between imagination and memory, the role of imagination in creativity, and the role of imagination in figurative language. 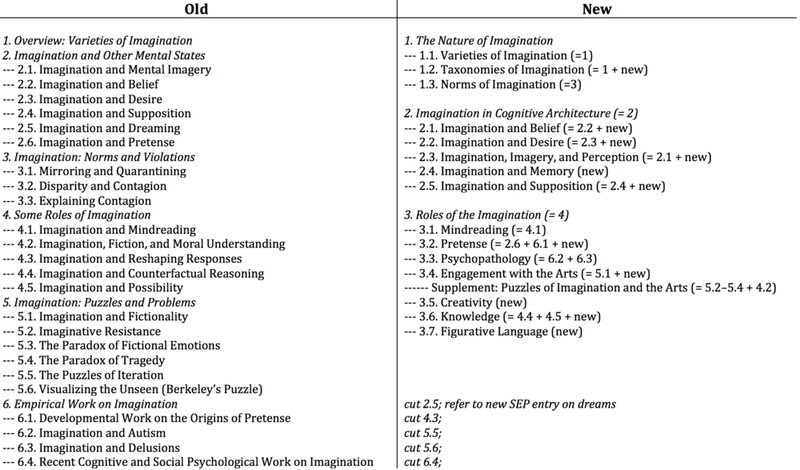 New materials have also been added to the subsections on imagination and the arts, and on imagination and knowledge. While traditional discussions of imagination and the arts have tended to focus on narratives, recent discussions have broadened the focus to include other arts, such as music and dance. Similarly, while traditional discussions of imagination and knowledge have tended to focus on conceivability, recent discussions have broadened the focus to include thought experiments, practical counterfactuals, and transformative experience. Again, these new materials reflect the increasing diversity of entry points in philosophizing about the imagination. (2) What are the inputs and outputs between imagination and ______? One significant change was made to reflect the diminished dominance of aesthetics in philosophizing about the imagination. The puzzles and paradoxes that arise from imaginative engagement with the arts have been moved to their own supplement. This was a highly imperfect compromise between not wanting the discussion of these puzzles and paradoxes to take up disproportionate amount of space in the main entry, and wanting them to still exist somewhere because they are not discussed elsewhere on Stanford Encyclopedia of Philosophy. (Can you believe there’s no entry on the paradox of fiction?!) I think the editors have now commissioned entries on some of the puzzles and paradoxes, but the supplement will remain as a placeholder until they become available. I hope that the new entry can continue to serve as a useful resource for philosophers wanting to learn more about the imagination literature, as the old entry has done for many years. With that in mind, I welcome suggestions for further revisions, additions, and subtractions. There are a few lacuna that I am already noticing. First, there could be more discussion specifically on empathy and imagination. This opportunity is especially salient given that the mindreading subsection is one of the few that mostly remained the same. So a refresh is called for; please suggest your favorite works on imagination and social cognition (which can certainly include your own)! Second, there is not much on sociopolitical discussions of imagination (as exemplified, arguably, by José Medina’s connection between imagination and epistemic injustice in The Epistemology of Resistance). In this case, I wonder whether the paucity might simply reflect the literature. Again, though, recommendations would be much appreciated. Third, despite broadening the arts to include music as well as narratives, the discussion of the role of imagination in aesthetics might still be too narrow. For example, it fails to cover the use of imagination to appreciate nature and to appreciate everyday objects. As the acknowledgements make clear, the new entry owes its existence to many many members of the philosophy of imagination community. I love being a member of this community because researchers come from such diverse perspectives, and I learn so much from each of them. (Just take a look at the different perspectives in the handbook!) And, of course, I am thankful to Eric Peterson and Amy Kind for their work in fostering the community through this blog.